Meaco 20L Review - Meaco's Biggest & Best? 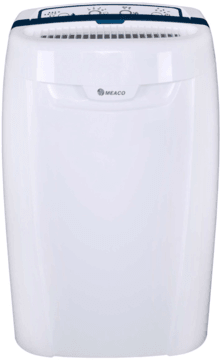 The Meaco 20L is the most powerful refrigerant dehumidifier for the home that Meaco produce. The ’20L’ refers to its maximum extraction rate, not the size of the collection bucket (being 3.5L). This puts this Meaco model up against our favourite (but much more costly) EcoAir DC202, so we’ll see how it compares. The Meaco 20L comes with everything you’d expect and hope for with a top-end refrigerant dehumidifier. If we run through the very easy to operate, four-button, soft-touch control panel, the first button controls the four dehumidifying options. 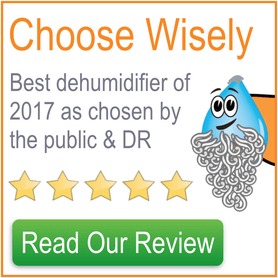 The Meaco 20L can be set at either 40%, 60% or 80% relative humidity (thanks to the inbuilt humidistat) through selecting either the three droplet, two droplet or one droplet option respectively. 60% humidity is what Meaco themselves recommend (two-droplet option), which is the upper-end of the recommended humidity band. 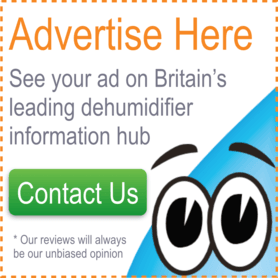 40% humidity would be ideal during colder weather (<5°C outside) and the 80% humidity option shouldn't be selected in UK conditions as it's well outside the recommended relative humidity range at normal UK summer and winter conditions. Meaco like to talk about their ‘control logic’ and with good reason. 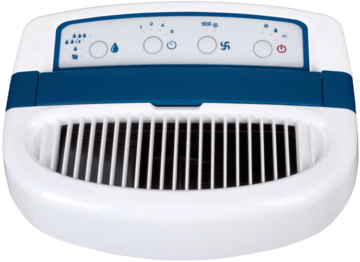 While nearly all dehumidifiers will stop dehumidifying when they reach the desired humidity, what Meaco dehumidifiers do differently is that they also switch their fans off to save energy. The fans will then switch on briefly every 30 minutes to test the humidity of the air and check that the humidity has remained within the targeted range. If the humidity is found to be above the targeted level then of course the machine will begin the dehumidifying process again. The result of this system is that you save on both electricity and noise. The fourth dehumidifying mode is the ‘laundry’ mode, which is essentially a ‘turbo’ mode that you may see on other models and runs the unit on full power until you turn it off (or the settable timer turns it off). The mode is perfect for drying laundry quickly indoors in winter or giving the house a quick blast if, say, someone has just come out of a long, hot shower. Next you’ll see the button for the timer. Again there are four options here, with a timer for either one, two, four or eight hours. This is a great feature, particularly when used in conjunction with the laundry setting as you wouldn’t want to leave it set on ‘laundry’ permanently, only long enough for the clothes to dry or you’d be wasting energy. I wouldn’t recommend using the timer mode with the other dehumidifying settings, as the humidistat is already turning the unit on and off when needed. The third button is for the fan speed. It’s great to see the 20L comes with two fan speeds, giving the option of blowing power when you need it and the benefit of less noise when you don’t. Personally speaking, I would prefer to leave the unit on the lower speed setting for day-to-day usage and kick it up to max when tackling stubborn mould areas or drying clothes. The final button is a simple on/off button, but you’ll also notice a light that comes on when the unit is defrosting (occasionally happens to keep the unit running efficiently when the room is below 16°C) and a light that turns on when the water collection bucket is full. As you’d expect, the Meaco 20L stops dehumidifying automatically when the bucket is full. The water collection bucket is about as large as they get in home dehumidifiers at 3.5L, which should keep to a minimum the number of times you’ll be required to empty it. The bucket itself is a really nice design, with just a small hole on the top to empty the water out of, limiting any chance of spillage on the way to the sink. There’s also a thin viewing window into the bucket, so you can judge how full it is without needing to open the bucket and stop the unit, although this is located on the back, so isn’t as easy to view as it could be. If you’re able to site the dehumidifier next to a sink, you should consider utilising the auto-drain function, using the pipe Meaco supply in the box. It’s great to see that Meaco have added an anti-bacterial silver filter to the 20L. The nano-silver coating on the filter kills bacteria and other microbial life upon contact, thereby cleaning the air dramatically (you’d be surprised how much bacteria is in the air). Just remember to vacuum clean the filter (do not run under the tap!) once per week to keep the air flowing freely. Portability is definitely not the Meaco 20L’s strongest area, however as a dehumidifier which is aimed at the 3/4/5 bedroom home, it was never meant to be. The appliance weighs 11.8kg unboxed, which is comparable with the majority of refrigerant dehumidifiers that are this powerful. It is quite large with dimensions of 35cm wide by 56cm tall by 26cm deep making it a little bit deeper and taller than similar dehumidifiers available. What redeems the 20L from a bad score in this area is the top-mounted sturdy retractable handle (see the blue area) and excellent set of castor wheels underneath that make wheeling the unit around easy. The castors also sit hidden underneath the model behind a ‘skirt’, so they are not unsightly. Meaco’s love of large expanses of ‘appliance white’ plastic continues with this model, although that doesn’t mean that I don’t like the look of it. The blue bar running through the sides and the top of unit and the details on the front panel do break the white up nicely. The reverse of the unit doesn’t look as nice, with a large intake grille (where the filter sits) and water collection bucket. Obviously it doesn’t matter that the reverse isn’t as attractive, as it’ll have it’s back facing a wall most of the time. However, having the intake on the reverse firstly means that you cannot push the unit tight up against a wall as it would restrict the air flow. Secondly, it means that you need to turn the unit around to access the anti-bacterial filter to clean it. Again you have to turn the unit around if you wish to access the water collection bucket or even the water-level viewing window. The top-mounted control panel is however well designed and laid-out. Meaco state that the 20L will produce 46dB of noise. This is very respectable but not quite market-leading for a 20L per day machine. I’ve heard it said that it sounds like a bathroom fan when in operation and I’d agree with this. Thankfully with two fan-speeds you have the option to select the lower one and make the unit quieter, even so, you’re probably not going to want to locate it where you watch television or sleep; a hallway is ideal. Similar to competing models, the compressor is very quiet and in normal operation it’s more the noise of the fans you tend to hear (unless sitting on a wooden floor that reverberates), which is a very ‘white’ noise and tends to blend into the background. This is the big daddy of the Meaco range. It has got the power to match that status and is absolutely powerful enough to control the humidity of a 5-bed home, which is how Meaco have rated it. The 20L per day rating is what you could expect to extract at 30°C and 80% relative humidity, so don’t expect that much water to be produced on a daily basis unless you happen to live in the Amazon rainforest. You could more likely expect to empty the 3.5L bucket once, or a maximum of twice per day. This is a solid refrigerant dehumidifier and if you look after it by cleaning the air filter once per week you can expect it to last for a long time indeed. 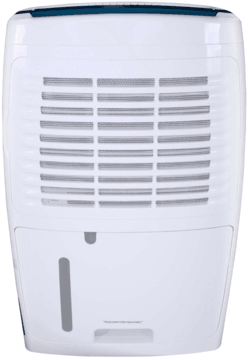 The Meaco 20L is a quality, powerful dehumidifier produced by a reputable British company. If you find the right price it doesn’t come at too much of a cost either versus it’s biggest competitors. The best price we could find was at this store, so have a look and see whether it’s tempting enough to buy.